Grand Turk, part of the Turks & Caicos Islands, was our first stop after boarding the ship in Fort Lauderdale, Florida. I had never been on a Caribbean Cruise before, only an Alaskan and Mediterranean Cruise. I am used to stopping at towns where people actually live or historic areas with tons of things to see and do. I am not used to stopping at a Cruise Center that is built just for tourists. But you know what, I could get used to it! Especially if the point of my vacation was relaxation. Off the ship and onto the beach in a matter of minutes. Easy peasy! There were excursions available for this port. Things like deep sea fishing, dune buggy safari and horseback riding. You could also go to town or golf, but I heard negative feedback about both of those experiences. We were there from 7am till 1pm and I thought that was the perfect time to spend at the beach. You couldn’t ask for a better FREE excursion. The beach is ready and waiting, right off the ship with free lounge chairs. My family took our snorkeling gear I had brought from home and found some really interesting things under the water. 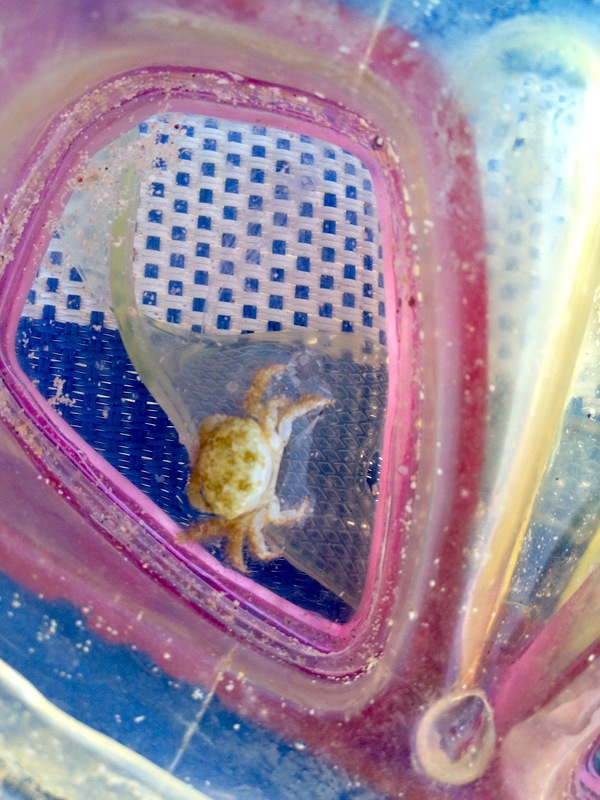 We found the little crab (below) and quickly put him back after snapping the picture. Toward the edge of the roped off swimming area it got really deep and the kids thought snorkeling in that area was awesome. I was a little scared. 😉 Grand Turk is the perfect port to just kick back and relax. Our ship was the only one there all morning. Then around noon a Carnival ship started to make its way into port. It was really cool to see it coming in right there in front of us. It was even more interesting because it had to turn around and try again. Don’t really know why, maybe it was a new driver. I have one of those in my house, so I totally understand needing a do-over. They made us get out of the water for the ship to come in. We knew there would be tons of people getting off the ship and heading to the beach, so we decided to pack up and explore the cruise center before heading back for lunch. I loved the hanging “egg” chairs at Jimmy Buffet’s Margaritaville. My daughter wanted one for her room. While one side of the pier has soft sand to play in, the other side is very rocky. It makes for some pretty pictures though. Also, there is a small Nasa exhibit because in 1962, the splashdown of the Mercury capsule piloted by astronaut John Glenn occurred just a few miles off the coast of the island. Not sure what the deal is with the whale, but I couldn’t resist taking a picture. 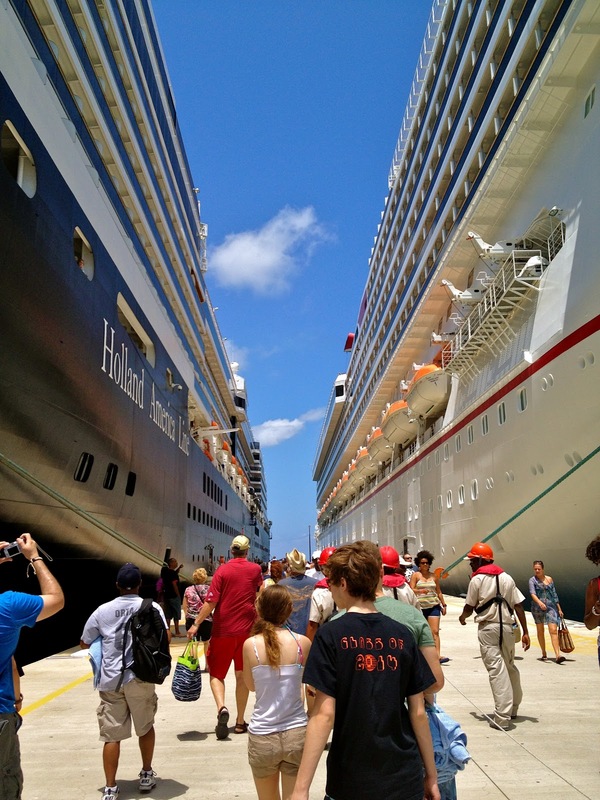 We knew when the Carnival ship arrived it would bring lots of people…and boy did it! We had just enough time for some cute family photos, some shopping for a collector spoon and back on the ship we went. I would say Grand Turk is a great cruise stop if you are just wanting to relax on the beach. It really couldn’t have been more relaxing and easy. 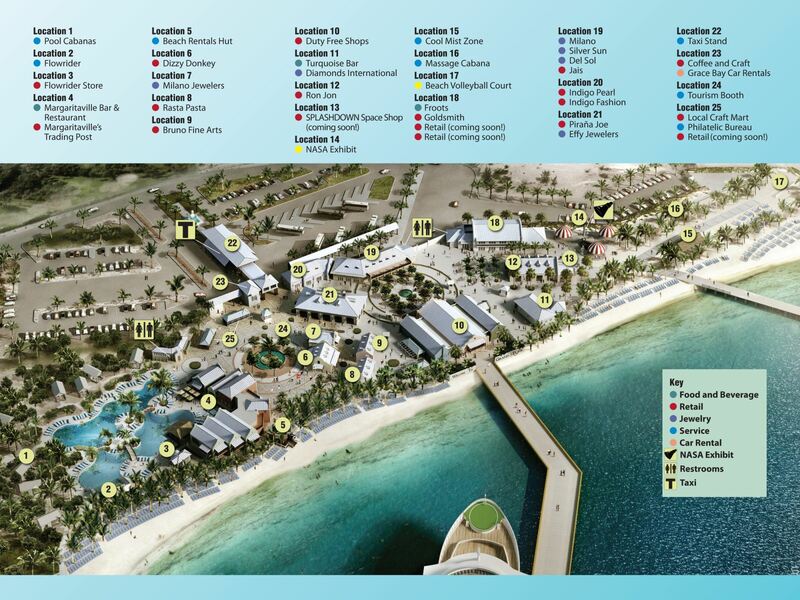 I’m including a map of the cruise center with all its shops, places to eat and hang out. Click on it to enlarge. Have you ever been to Grand Turk? What excursions did you do while you were there? Friday Daydreamin’ with RWeThereYetMom? and Budget Travelers Sandbox and Delicious Baby. Looks like you had sooo much fun! I love taking cruises 🙂 My next cruise is in June, I can't wait! Oh fun, where are you cruising to? Aren't those chairs cute! Yes, I think all you would want to do in Grand Turk is relax on the beach. No I haven't but it looks amazing. Great Pics, I hope to get there. Very beautiful and relaxing…I hope you get to go there as well! Take me to that beach…now! Your photos are gorgeous; so crystal clear. Thanks! I really tried hard on the photos this trip…that means a lot! Perfect place to Friday Daydream! Thx for linking up! Beautiful photos! We cruised on the Eurodam for spring break four years ago and our first stop was supposed to be Grand Turk but the seas were so rough that we had to skip the port. And I had been so looking forward to just relaxing on the beach like you did! Will have to try again some day! It was a super relaxing spot. So if you were on the Eurodam, that means Holland America, right? Did you stop at Halfmoon Cay? Will be posting about that next. Beautiful beach!!! I've been on a Caribbean cruise, but it didn't stop at Grand Turk. It's always interesting to me how massive the boats look when they're in a secluded area. The ship to beach "hike" looks nice and short. That's hilarious that the Carnival ship had to pull a do-over. (Perhaps this explains a lot about Carnival nowadays.) Why did they clear the water? Did a big wave come in as they got near shore or were they worried people would get run over by the boat? Haha! I think clearing the water was just a safety precaution, because there really wasn't a wave or anything. Now that I think about it, that is pretty surprising that there wasn't a wave. It was interesting to watch it come in though. I just love the turquoise water and white sand of the Caribbean! I haven't been to Turks yet though. Looks like my kind of place. Our daughter wants one of those chairs for her bedroom too. Those ships look scarily big. I've been here before, and will be going back in Aeptember. It is beautaful, however, though I've heard much of Jack's Shack-the location of which totally eludes me. Its not on your map…where is it? It is 500 meters North of the Cruise Center. We didn't walk that far, we just stayed in the cruise center area. Have a great time on your trip!